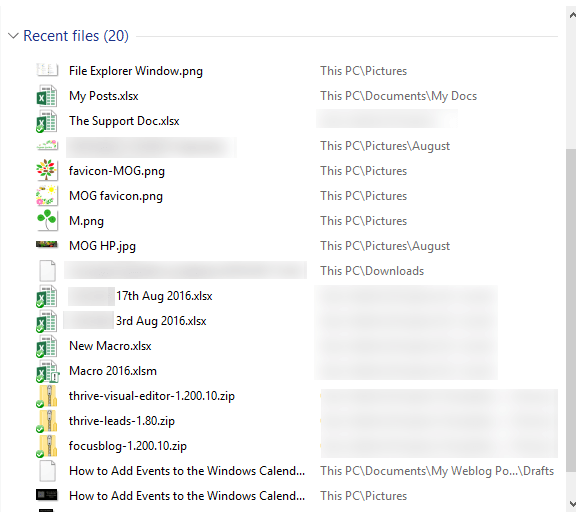 The Windows File Explorer Folder lets you easily access all your recent and pinned files and folders. But in Windows 10, it is a bit of a nuisance as all your recently opened files and folders show up and you don’t want to scroll through a long list of them to find a file you need. 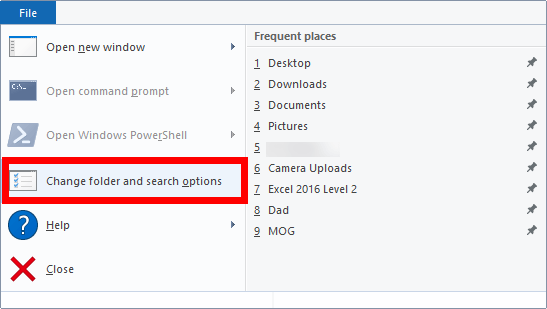 You can clear the recent files history in Windows 10 to eliminate this problem and here’s how you do it. There are a couple of ways in which you can get rid of the Windows File Explorer History. You can turn off recent times and frequent places completely or you can occasionally clear up the history and start from scratch. Let’s take a look at both options. 2. 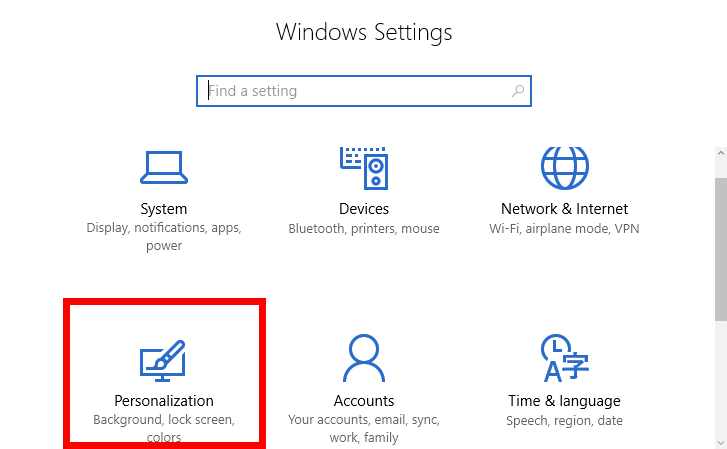 On the Settings screen, click Personalization. 3. In the Personalization screen, on the left pane, click Start. 4. 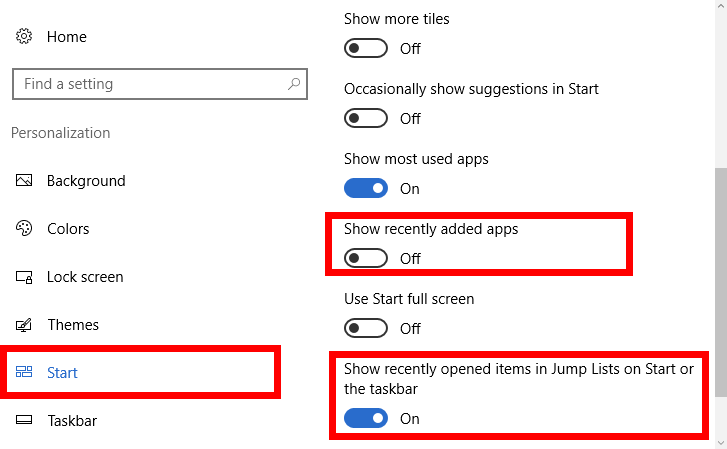 In the right pane, turn off Show recently added apps and Show recently opened items in Jump Lists on Start or the taskbar. This will clear all recent items from the jump lists and File Explorer except the ones you pinned. 2. Click the File menu and then choose Change folder and search options. 3. In the Folder Options dialog box, on the General tab, in the Privacy section, click the Clear button. This will immediately clear your File Explorer history. NOTE: You will not receive any confirmation message when the history is cleared. 4. 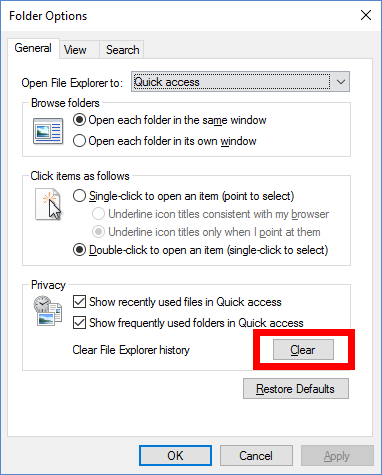 When the recent files history is cleared, click OK to return to File Explorer. You can check the File Explorer window to confirm that all recent files are removed. So the next time you find yourself in need of some space, at least on your File Explorer window, use these simple settings tweak to solve the problem.